Who doesn’t love a mys­tery? Whether your find them intrigu­ing puz­zles or can’t-wait-to-know-the-solution page-turn­ers, a good mys­tery is engross­ing and a lit­tle tense. Throw in a lit­tle humor, a detailed set­ting, and well-drawn char­ac­ters and you have a book you can con­fi­dent­ly hand to young read­ers who are already hooked on the genre and those who have yet to become fans. We are pleased to fea­ture Turn Left at the Cow as our May book selec­tion, writ­ten by the expert plot­ter Lisa Bullard, replete with her char­ac­ter­is­tic humor. 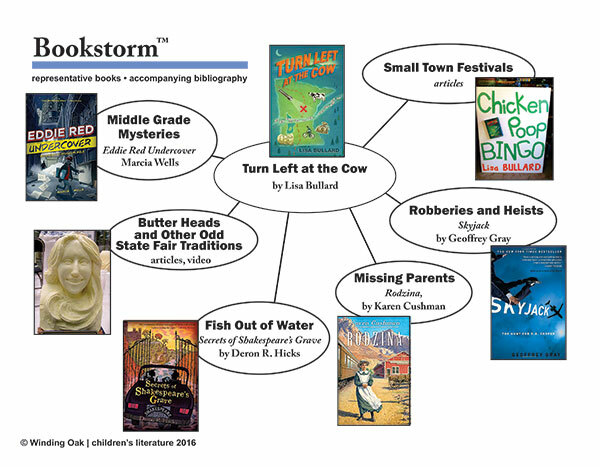 In each Book­storm™, we offer a bib­li­og­ra­phy of books that have close ties to the the fea­tured book. You’ll find books, arti­cles, and videos for a vari­ety of tastes and inter­ests. This month, we’re focus­ing on books for mid­dle grade read­ers with mys­ter­ies, humor, and bank heists. Don’t miss the excep­tion­al resources on the author’s web­site. Try your hand at but­ter carv­ing with “But­ter Head Beau­ties,” engag­ing sci­ence, art, and lan­guage arts skills. Re-cre­ate the book’s chick­en poop bin­go with “Chances Are,” call­ing on math and lan­guage arts. Lisa Bullard’s Pin­ter­est page has more great ideas that you’ll find use­ful as you incor­po­rate this book into your plan­ning. Mid­dle Grade Mys­ter­ies. There are amaz­ing books writ­ten for this age group. We’ve includ­ed a list that would help you select read-alikes or com­pan­ion books, draw­ing on titles first print­ed in 1929 (yes, real­ly) to 2015. But­ter Heads and Oth­er State Fair Strange­ness. A but­ter head is one of the atten­tion-wor­thy objects in the book. Begin an online research assign­ment with a few arti­cles about but­ter heads around the coun­try. Fish Out of Water. Travis lives in south­ern Cal­i­for­nia. When he runs away to his grandmother’s cab­in in north­ern Min­neso­ta, it walks and talks like a dif­fer­ent world, one that Travis has to learn to nav­i­gate if he’s going to solve the mys­tery. Miss­ing Par­ent. Even though Travis left his moth­er behind with her new hus­band, Travis is most inter­est­ed in find­ing out about his dad, who died before he was born. Books for this age group often revolve around a par­ent or par­ents who are not present. We’ve rec­om­mend­ed a few of them. Rob­beries and Heists. Travis has trou­ble believ­ing his father could have robbed a bank but the towns­peo­ple seem to think so. We’ve includ­ed books that delin­eate bank or train rob­beries, some of them true. Small Town Fes­ti­vals. 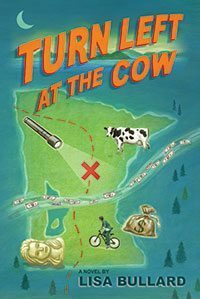 One of the most excit­ing scenes in Turn Left at the Cow takes place in Green Lake, Minnesota’s annu­al sum­mer fes­ti­val where chick­en poop bin­go is a tra­di­tion. We’ve found arti­cles about oth­er small town fes­ti­vals that would make good writ­ing prompts, research projects, or Pow­er­Point projects. Mys­ter­ies offer a spe­cial plea­sure to many read­ers, both chil­dren and adults. They pro­vide an excel­lent oppor­tu­ni­ty to talk about plot and how that plot is rein­forced by intrigu­ing char­ac­ters (and good writ­ing! ).